Today I had the privilege to witness my niece and goddaughter Maya receive her First Communion. Tomorrow I get to witness another Goddaughter, Lilly receive her second communion. Oh how I wish I could be in two places at once, but alas, I am not so holy as to bi-locate. I am working on it though, but I am not holding my breath. Something beautiful happened during the Mass this morning. Right after Maya received Communion, I was completed overcome by a powerful sense of Courtney’s presence. I looked up at the tabernacle and visualized my girl standing right there behind a gauzy drape, holding hands with my Dad. She was pointing to Maya saying “Grandpa look…” She was beaming from ear to ear and my Daddy’s face was just as joy filled. Standing next to Courtney were two little tow-headed boys. I imagine they were our sons we lost in miscarriage, Simon and Oliver. I realized that every time I am at Mass and receive communion, my daughter is standing right on the other side of that veil, joining in witnessing the most beautiful and sacred acts of love. When I receive my Lord and He receives me. She is “this” close at all times and I am so blessed by that knowledge. The tears just came and it took me by surprise. I was not expecting it at all. Thank goodness for my always prepared sister-in-law, who had Kleenex at the ready. My Mom just reached over and held my hand, not ever asking what was happening, but instinctively knowing that Courtney was at the center of it. Mother’s…always knowing what is needed in the moment. Mother’s Day will arrive with the sunrise tomorrow. It’s a day that is bittersweet for me. I miss my Courtney so much but God granted me a beautiful gift by giving me a passel of Godchildren. Nine to be exact. It amazes me how the Lord takes your past mistakes and makes such beauty come from them. Every woman is made to be a mother. Unfortunately not all women get to physically bear a child. Some come to motherhood through adoption and others by becoming Godparents and also through mentoring. You see we are meant to be mothers. Our bodies are made to carry another human being. Whether we get to actually do that or not we are wired to nurture and bring forth life. We are wired to love others and care for them. We are wired to encourage and support. As a mother I got to do that in the physical sense. As a Godmother I get to do it in the spiritual sense. It is a gift to me to have nine other children who need my love, support and encouragement. I pray for each of them by name every single day. They are as much children of my heart as Courtney and Jonathan. I cherish them and am so very honored to be able to call them “children of my heart”. Today was filled with laughter and so much love. Maya’s name means “generous” and I am so grateful that my brother and his wife were so generous with their little girl that they trusted me to be her Godmother. 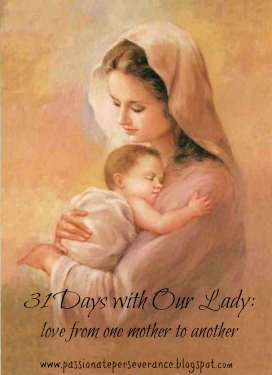 I am humbled by their trust and am constantly asking Our Lady to help me in praying with and for ALL of my children, whether they be physically mine or spiritually mine. After all she is the mother to ALL of us. Our Queen and our protector. She wraps her mantle around us surrounding us with love and grace, always encouraging and uplifting. Thank you for always being there to guide us and encourage us. Thank you for showing me how to be a mother. Thank you for showing me that love is the greatest gift I can give ALL of my children. I ask that you be with them as they grow in faith and learn more about you and your Son. Always be with them, be a light unto their path leading them to your Son who gave his all showing His abundant love for them. May we be as generous with ours.